Manila protested against Beijing's test flights over the disputed Kagitingan Reef (Fiery Cross Reef) in the Spratly archipelago. MOSCOW (Sputnik) — The Philippine government has protested China's test flights over the Kagitingan Reef in the disputed Spratly Islands archipelago, local media said Wednesday. "We formally protested on 8 January 2016 the recent test flights conducted by China to the Kagitingan Reef (Fiery Cross Reef) and its provocative actions restricting the freedom of navigation and overflight in the WPS (West Philippine Sea)," Foreign Ministry spokesman Charles Jose said, as quoted by GMA News. The Fiery Cross Reef is claimed by the Philippines, Taiwan and Vietnam but is under Chinese control. On January 6, China conducted two test flights in the area, landing on an artificial island in the archipelago, according to Chinese media reports. The airstrip has been under construction since 2014 when the Chinese government began land reclamation activities on the reef. China's test landing was described as a violation of the Association of Southeast Asian Nations (ASEAN) China Declaration on the Conduct of Parties by Jose. The declaration was signed by China and ASEAN in 2002, and aims to mediate relations between claimant states in the South China Sea. "These actions by China have elevated tensions and anxiety in the region," the spokesman said. Earlier in January, Vietnam's Foreign Ministry also gave a note of protest to the Chinese ambassador over the incident, accusing China of violating Vietnam's sovereignty. Beijing has rejected the note, labeling the accusation as baseless. Other South China Sea disputes concern the Paracel Islands and the Scarborough Shoal (Huangyan Island). 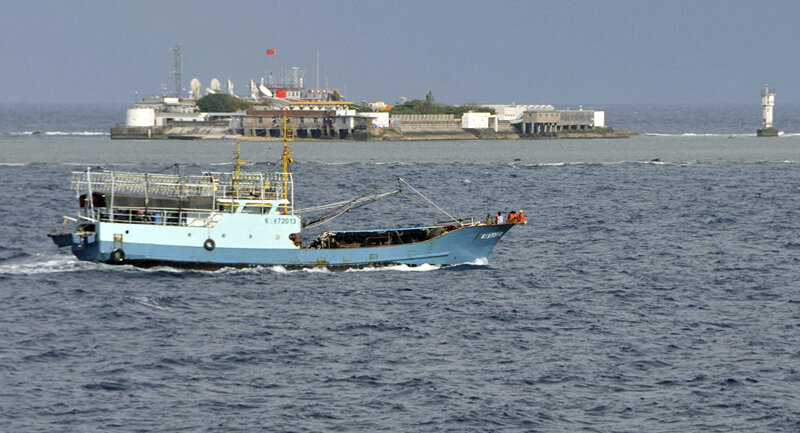 In 2013, the Philippines took a case to the International Tribunal on the Law of the Sea (ITLOS), challenging China's claims to some of the territories. China has rejected the use of arbitration to resolve the disputes.